Hardware manufacturers use trade shows not only to display upcoming commercial products, but also to demonstrate and collect feedback on concept devices that may or may not become full commercial products. 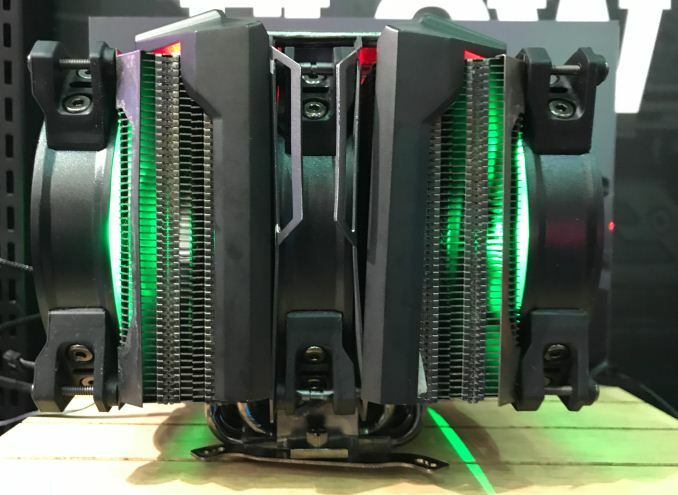 Cooler Master used Computex to demo two of its concept coolers, one of which featured a closed-loop heat pipe along with three fans, another used a large heat column and a rather unarthodox design. Although many performance enthusiasts nowadays choose all-in-one liquid cooling solutions over air coolers because of dimensions and efficiency, oversized CPU tower coolers still have their own advantages: there is no risk of leaking, they are large and therefore they can cool down chips even if their fans fail, they are rather affordable too. 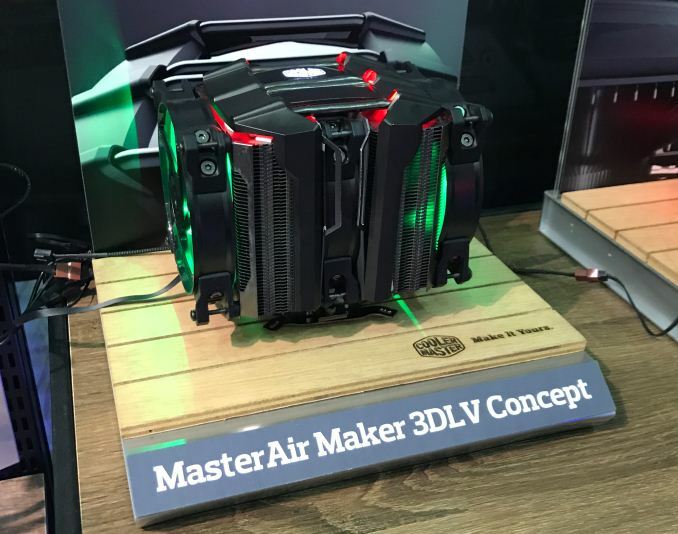 The MasterAir Maker 3DLV is one of Cooler Master’s concept coolers. It has two large radiators connected together using four closed-loop heat pipes and featuring three 120-mm fans. The main idea of heat pipes is to quickly transfer heat from the bottom of the cooler to fins located along the path of the pipes, away from the heat source. Closed-loop heat pipes have been explored by multiple companies and Zalman’s CNPS 9000-series coolers actually take advantage of them. The CNPS 9000's are round and the closed-loop heat pipes actually transferred heat to all fins. Meanwhile, CM’s 3DLV concept cooler is rectangular and does not have any fins on its top, just bare pipes and we have no idea how efficient such a configuration is. Still, three fans should ensure rather high efficiency anyway and the manufacturer promises that the cooler can remove up to 200 W of hear. In the meantime it is unclear whether Cooler Master will actually commercialize this model, as due to its large dimensions it is not compatible with high-end memory modules that have large heatspreaders. 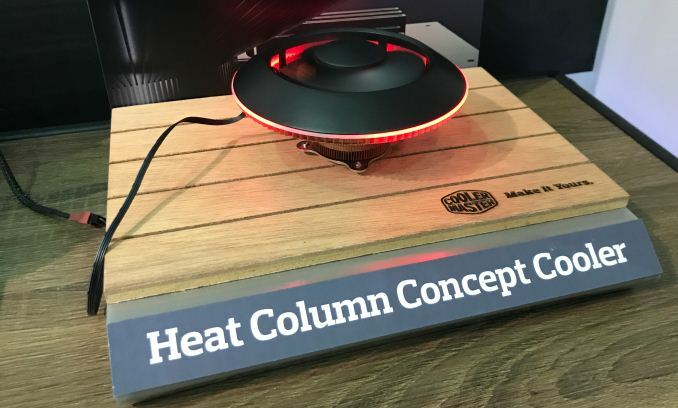 Meanwhile the Heat Column Concept is another cooler that CM demonstrated at Computex. This cooler resembled a flying saucer and featured a huge heat column on its base. The flying saucer cooler is made of copper and therefore quickly absorbs heat. The producer rates the device at 100 W TDP, which means that it can cool down all mainstream CPUs in the AM4 and LGA1151 form-factors from both manufacturers. Cooler Master has not decided the final specs of the cooling solution or how to position it yet. 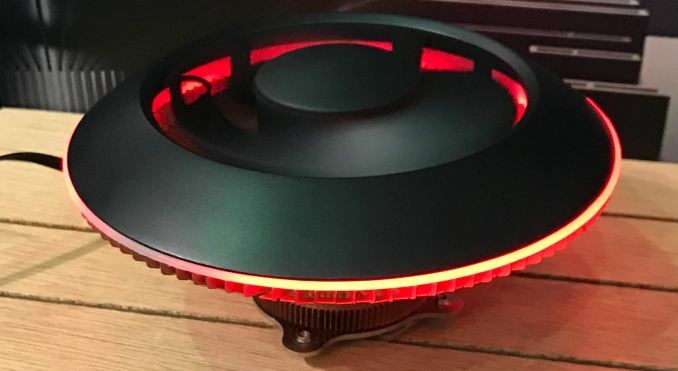 One of the things the company’s engineers are thinking about are dimensions: they could make the “saucer” smaller and position it for, say, Mini-ITX system, or make it larger and then appeal to overclockers/modding community. 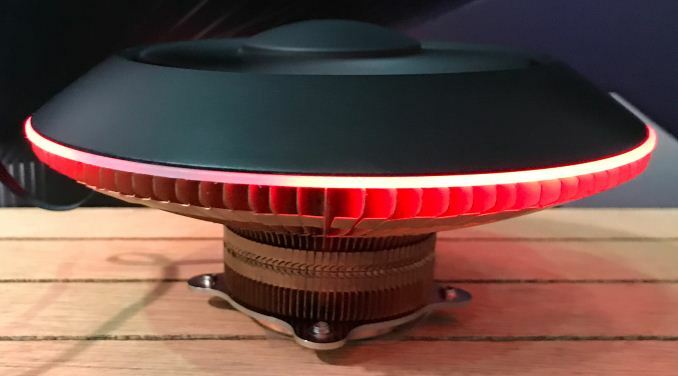 One of the things that the triple fan and the saucer coolers integrate is user-configurable RGB LED lighting, which is becoming an important feature. Because enthusiasts appreciate customizable lighting, it makes sense for Cooler Master to offer it not only with new cases, but also with CPU coolers.